3+ Bedrooms and 3 Bathrooms, Large Private Pool. Gated Community of 19 homes. 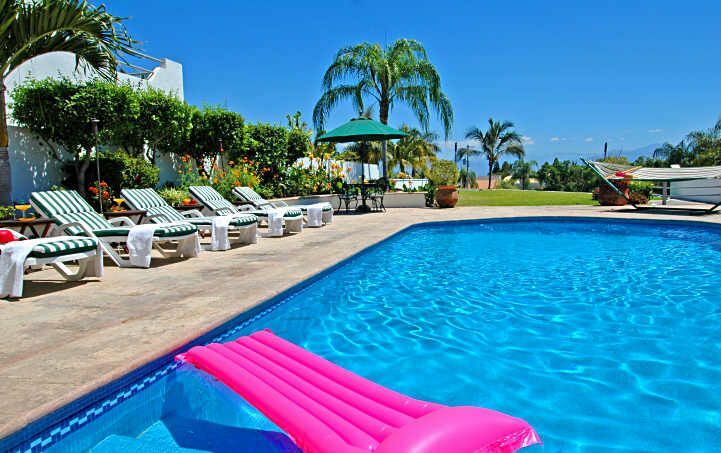 Casa Parota - Large and Luxurious: Casa Parota is the largest house and among the best-furnished in the neighborhood. Casa Parota has full stereo surround-sound with CD, US & Canadian TV, five TVs (HDTV in Living Room and Master Bedroom), two VCRs, four DVDs. 150+ movies. It offers a complete kitchen with a dishwasher, disposal, microwave, gas stove/oven, and refrigerator. There is a full laundry room with a large washer and dryer; an iron and ironing board are provided. Special features include Oriental Rugs, numerous oil paintings, Italian dishware, and gourmet cookware. The dining room table seats eight, with room for three at the bar. A 2010 Ford Expedition Limited (8 seat belts) with leather, third seat, CD/MP3, and iPod jack is available as an option at a cost of $70 USD/day. We can arrange for the car to be at the airport upon your arrival, and you can leave the car at the airport upon departure. Maid, swimming pool, and yard service are included. US and Mexican property managers to help you with anything. 2+ Bedrooms & 2 Bathrooms Upstairs: Casa Parota has two bedrooms upstairs; plus one room has been turned into an office with sleeping accommodations. Three bedrooms have private bathrooms, satellite TV (US and Canadian stations from Seattle, Detroit, LA, NYC, Toronto), a clock/radio and a phone. The master bedroom also has a VCR & DVD. The large master suite upstairs has a California king-size bed and a private bathroom/shower/soaking tub and patio. There is separate air-conditioning/heating in all rooms. One bedroom downstairs, plus new workroom with additional sleeping. Office with queen-size bed, and has a deck overlooking the swimming pool and bay. It offers a PC computer, fax, e-mail, phone, answering machine, and a futon. New-Highspeed WiFi Internet! Free unlimited phone calls to ANYWHERE IN THE WORLD. 1 Bedroom & 1 Bathroom Downstairs: One bedroom downstairs comes with a private bathroom/shower and a California king-size bed, or two extra-long twin beds; your choice. Second room downstairs has a double size bed. There is an extra-large deck upstairs off the Master Suite and office, which overlooks the Bay of Banderas and the lights of Puerto Vallarta. There is patio furniture downstairs and on the deck upstairs, which includes a table, chairs, and lounge chaises. The Punta Mita Four Seasons Hotel with a Jack Nicklaus-designed Golf Course (includes a floating green!) is 20 minutes north of Casa Parota. Destiladares Beach Restaurant - Free - is 5-7 minutes north towards Punta Mita. Or visit the hippy surf town of Sayulita or San Francisco (also called San Pancho). BOSE iPod docking station in living room/dining room. iPOD connection in optional Ford Expedition Limited, also. Little did we know when we built CASA PAROTA over 15 years ago, that this was to become the hot area of the Bay of Banderas. We were isolated, now we have it all, but with peace and quiet at La Puntilla. Someone recently said that there will never be a La Puntilla, we have so much property with only 19 homes. Paradise found. 1 Bathroom downstairs, 2 Bathrooms upstairs. Bathroom downstairs is accessible from bedroom or hallway. Master bathroom upstairs is accessible from bedroom or hallway. Bathrooms and master dressing room remodeled in 2013. All Bedrooms and Living Room/Dining Room/Kitchen are air conditioned. HDTV in Living Room and Master Bedroom. Satellite service available in all bedrooms, workroom, and living room with separate receivers. US and Canadian TV stations. Premium stations included. CDs available, or bring your own. BOSE iPOD Docking Station in Living Room/Dining Room. Over 180 movies - from classics to new releases. Balcony off upstairs bedrooms and office. We can arrange a fishing or whale watching charter; snorkel tours also available. All depart from La Cruz marina. Over 1800 square feet of stone decking surrounding pool. Over 1/4 acre of private property. Private patio and seating outside downstairs bedroom. at Vallarta Gardens, Flamingoes, or Four Seasons. We have a wheelchair ramp to go from Dining Room to pool area. Extra large 15 feet by 30 feet - custom design. THIS HOUSE ON GOOGLE EARTH. KEY-IN 'CRUZ DE HUANACAXTLE' OR 'EL TIZATE'. THEN ONCE THERE, KEY-IN 'CASA PAROTA AT LA PUNTILLA.' YOU CAN ALSO SEE ALL OF OUR RENTAL HOUSES IN THE AREA. From airport, north on Hwy 200 towards Tepic-Compostela. Then at El Tizate-Punta Esmeralda, turn on Hwy to Punta de Mita, La Puntilla at Km 1.5. La Cruz de Huanacaxtle is home to the new 400-slip Marina Riviera Nayarit which includes world-class fishing charters - e.g. dorado (mahi mahi), huachinango (red snapper), sailfish, ahi (yellow fin tuna) and marlin. 7 Golf Courses surround Casa Parota. Along with numerous fabulous restaurants, beach clubs, and sightseeing. La Cruz is located in the center of the newly-emerging North Bay area, which extends from Bucerias to Punta Mita (home of the Four Seasons Punta Mita), and beyond to Sayulita and San Francisco (also called San Pancho). See Webs ite for MAPS page.